Patellar tracking disorder is caused by a set of muscular imbalances around the knee that causes the patella, or kneecap, to shift laterally or tilt out of place as the leg bends or straightens. One important dynamic stabilizer is the Vastus Medialis Obliquus (VMO), the inner section of the quadriceps that pulls on the inside edge of the kneecap. When the VMO is weak and the Vastus Lateralis (the muscles on the outside of the thigh) is tight, the patella can be pulled outward and off track. Tightness of the vastus lateralis and IT band. Weakness of vastus medialis and quadriceps. Repetitive activities or movements that cause repetitive stress to the knee – specifically those that include a twisting motion. Issues with the structure of the knee bones causing misalignment. Traumatic injuries to the knee. A dull ache under or around the kneecap. A popping, grinding, slipping, or catching sensation in the kneecap as the knee bends or extends. A buckling or “giving way” of the knee where the knee suddenly fails to support body weight. Most people with patellar tracking syndrome can avoid surgical intervention through physical therapy and at home treatment. Always check with your doctor before beginning any at home stretching or exercise program. Rest from the aggravating activity. Ice the knee for 20 minutes at a time for 2-3 days, then experiment with heat to see if it helps. Take an NSAID (nonsteroidal anti-inflammatory drug) to decrease pain and inflammation. Brace with a compression sleeve or tape the knee to provide extra support to the joint. Stretch and practice self-myofascial release (SMR) techniques to loosen the tensor fascia latae, vastus lateralis, and IT band. Once symptoms of a flare-up have resolved, perform these exercises to re-establish strength and mobility around the knee joint. These exercises are meant to strengthen the muscles surrounding the hip and knee – specifically the quadriceps, adductors, and vastus medialis muscles – returning them to normal functioning. It is also important to continue to increase the flexibility of the lateral muscles of the thigh and hip. Patience, dedication, and consistency are vital to seeing results. Practice these exercises daily up to three times per day. You’ll need a small towel and a foam roller. This foam roller exercise helps release the IT band. When the IT band is tight, it pulls the kneecap out laterally, causing pain and further aggravating patellar tracking disorder. Start by lying sideways on the foam roller so it rests right under your outer right hip. Straighten your right leg. Then, bend your left knee and step your left foot in front of your right thigh. Lean into your right palm so that your right arm and your left foot are controlling the amount of weight you are placing on the foam roller. Very slowly roll the foam roller down the outside of your thigh towards your knee. Stop to hold for 20 seconds whenever you find a tight spot, then, continue on until the roller is right above the knee. Then, slowly reverse and roll back up towards the hip, again stopping when you feel a tight spot. Once you get back below the right hip, switch to the other leg. This exercise teaches you to engage the quadriceps and is important for practicing the Tapping Technique exercise below. Begin seated on the floor. Roll up a small towel and place it under the knee of your straightened right leg. Your left leg should be bent with the foot on the floor. Engage your quad muscles and flex the toes back towards the shin, pressing the back of your knee into the towel. Hold for about 5 seconds, then release for 5-10 seconds. Repeat for 12 reps, then switch sides. The tapping mechanism activates the vastus medialis muscle that can become weak or inactive in those with patellar tracking syndrome. Begin seated on the floor with your right leg straight out in front of you. Externally rotate your right leg so that the toes point off to the side at a 45-degree angle. Take the index and middle fingers of your right hand and begin to palpate/poke the vastus medialis – this is the teardrop shaped muscle right above and inside the knee. Continuously tap this muscle as you squeeze and contract the quadriceps muscle – imagine you are lifting the quadriceps muscle away from the kneecap. Continue to squeeze and release for one-second intervals, tapping continuously. Repeat for 15 contractions, then switch legs. This exercise strengthens the quadriceps and hip flexors. Start lying on your back with one knee bent so that the foot is on the ground. Straighten the other leg out in front of you and engage your abs so that your lower back is touching the ground. Engage the quadriceps muscles in the straight leg by flexing the toes back towards the shin and press the back of your knee flat down towards the floor. Then, slowly lift the leg 12-18 inches off the floor. Hold for about six seconds, then slowly lower the leg back down and rest for a few seconds. Do this for 12 reps, then switch sides. This simple balancing exercise helps to activate and engage the gluteus medius that often becomes weak in those with PTD. Begin standing up with your feet together and your hands together in front of your chest. Pick something in front of you to look at the entire time. Engage your abs. Then, slowly shift your weight onto one leg and pick up the other leg, bending it to 90 degrees and bringing the thigh parallel to the ground. Keep a small bend in the standing leg. Hold for 20-30 seconds, see if you can feel the outer hip working to keep you steady and balanced. Then switch sides. This exercise strengthens the quadriceps, vastus medialis, adductors, and glutes. Begin by lying down on your back with your knees bent and your feet hips-width distance apart. Place your arms down alongside your body with your palms facing down. Lift one leg straight up towards the ceiling and flex the foot so it looks like it is pressing into the ceiling. Take an inhale, then exhale as you slowly lift your hips up towards the sky to come into a bridge position. 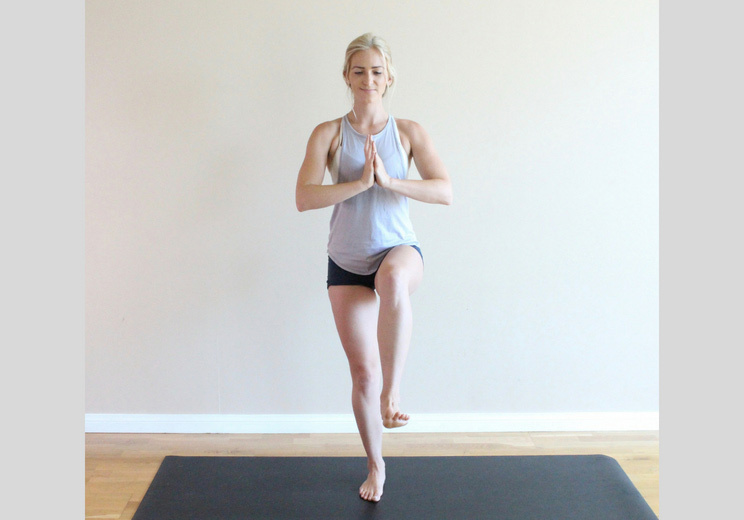 Firmly press through the foot of the bottom leg, slightly engage the glutes and lift up through the inner thigh, keeping your knee in line with your toes. You should feel your quads, inner thighs, glutes, and core working. Tip: To modify, bend your lifted knee to a 90-degree angle. Hold for 30 seconds, then slowly lower back down. Switch legs. This exercise strengthens the outer hips to bring stability down to the knee joint. Lie down on one side with your hips stacked and your knees bent. Rest your head on the hand of your bottom arm. Pace the top hand on the floor in front of you. Engage your abs, then keep your feet together as you open your knees like a clamshell, stretching the top knee up as far as you comfortably can without rolling your hips open. Pause here for three seconds, then slowly come back to the starting position. Why Do Some Women Always Date Losers?